This post was contributed by Heidi Lindroth, PhD Candidate, RN, University of Wisconsin-Madison, School of Medicine and Public Health, Department of Anesthesiology School of Nursing. Delirium impacts approximately 25% of hospitalized elders, 50% of hospitalized adults following their surgery, and 80% of those that are mechanically ventilated in the Intensive Care Unit (ICU).2,3 Unfortunately, 60-70% of patients with delirium are not correctly recognized or treated.3–5 Awareness of this dangerous syndrome is key to recognition, prevention, and therapeutic support. Recently, three delirium societies united to form an International Federation of Delirium Societies, (iDelirium, @iDelirium_Aware, www.idelirium.org)6 that unites a global force of clinicians and researchers fighting to understand why this syndrome occurs and how we can prevent it. 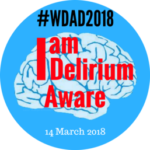 As a result, World Delirium Awareness Day (#WDAD2018) was born, and this year it occurs on March 14th, 2018. 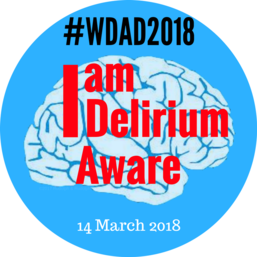 #WDAD2018 promotes positive energy around awareness of this dangerous syndrome and spreads the word on how to identify those at risk to prevent this prevent delirium from occurring. Research on delirium has steadily increased over the past ten years. 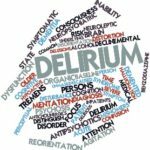 In 2017 alone, 1,126 research studies were published on PubMed about delirium. Influential leaders have begun to highlight the need for policy change regarding how we care for patients with delirium.7 In the February issue of Journal of the American Geriatrics Society (JAGS), Dr. Sharon Inouye, @sharon_inouye, spotlighted this call to action with her article “A Framework to Improve Acute Care for Older Persons”. She highlights the need for leaders in the field to revolutionize the experience aging.8 We need to join the #WDAD2018 and help keep the momentum going! World Delirium Awareness Day has spurred a burst of activity focused on delirium awareness. In the UK, Dr. M S Krishnan @psychinformatic has created a #icanpreventdelirium National Award for #WDAD2018, a Delirium Awareness Video now viewed by 23,606, buttons, capes, and a 1.75 mile walk today help raise awareness about delirium. Meanwhile, Dr. Roberta E V Castro @robertaevcastro created a workspace for Brazilian intensivists to participate in #WDAD2018 and is promoting tailored information focused on delirium awareness. In Australia, Dr. Meera Agar @meera_agar is paving the way towards delirium awareness in palliative care and submitted a proposal for all the Vice Chancellors in Australia to create a Delirium free Australia by 2020. These Delirium luminaries are making a difference! Today is World Delirium Awareness Day, but the time to spread awareness about the importance of delirium is every day. We must remember how terrifying and detrimental delirium is for those that experience it and work towards prevention, identification, and providing support for anyone experiencing delirium. Today is a day to be positive about how much progress we have made in this field of research and to create forward momentum, making even more progress in the year ahead. Today is the day that all of us become inspired and pledge to do our part. Thank you for participating in #WDAD2018! Art and Science of Delirium. Art Sci Delirium. March 2018. https://artandscienceofdelirium.wordpress.com. Inouye SK, Foreman MD, Mion LC, Katz KH, Cooney LMJ. Nurses’ recognition of delirium and its symptoms: comparison of nurse and researcher ratings. Arch Intern Med. 2001;161(20):2467-2473. World Delirium Awareness Day 14 March 2018. iDelirium. March 2018. http://www.idelirium.org. Posted in NIDUS Blog and tagged #WDAD2018, Delirium, ICU delirium, World Delirium Awareness Day.